This is a glass vase I decoupaged with pages from an old hymn book I found in the dumpster. Here's what I did if you want to give it a whirl. 2. Paint the back of the paper with Mod Podge (I used matte) and stick the paper onto your surface. 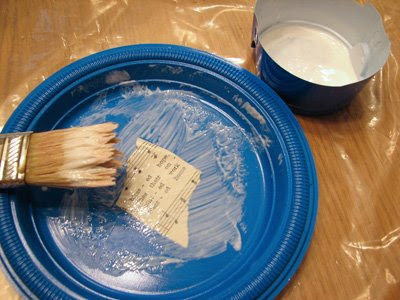 Then paint more glue over the top of the paper and use your finger to smooth out the wrinkles. Cover the whole surface of your object, one piece of paper at a time. Let dry. 3. Paint on decorations with acrylic paint, or paste on some colorful paper shapes with more Mod Podge. I painted on this stripe at the top. Very neat! What type of flowers are those in the vase, btw? Mod Podge is my friend, I mean my middle name, Imean my day job! I love that stuff! Fantastic. I love the black and white type with the orange. Brilliant. I think the flowers are some kind of chrysanthemum. They smell like mums, anyhow. I got them at the grocery store. Any flower experts want to weigh in? Yeah, they look like mums to me. Some type of spider mums, probably. Where did you get the curtains? I love them! thank you so much for this post! i recently purchased over 5000 vintage french wine labels for a client of mine who is building a boutique winery and loves contemporary art. my plan is to decoupage the labels on to large pre-stretched canvas. not sure if we are going to organize the labels by color, region, vintage or what, but i am SO excited about the project. and after seeing this post i feel much more confident. thanks again! I painted the curtains--see here. Melissa, you might also check out acrylic gel medium (Liquitex and Golden are two common brands). It MIGHT work a little better with canvas; not sure. I think it's probably higher quality stuff. It's thicker, so you might need to thin it with water. (You use the same technique of putting some on the back and the front of the paper.) It's what I've used with canvas before. (Like here. Get some of each and test it--worth it if you're doing that many. "Tear up some thinnish paper"
I knew I saved those Norton Anthologies for all these years for something! I can't wait to try this. Great tutorial! I've been saving "thinnish paper" from various sources in hopes that I would ONE DAY get myself to actually decoupage. Great idea, the vase came out really cute! That vase is so cute! I'm afraid if I start decoupaging it will turn into an addiction. So you don't need to add a protective sealant, even with the paint? 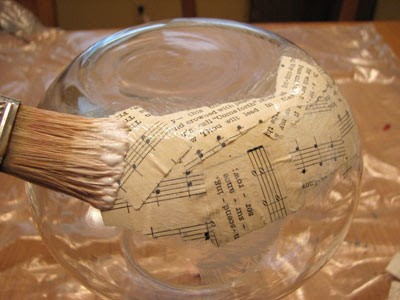 I used to love to decoupage -- I found it very relaxing. I have an unopened bottle of Mod Podge on my craft table, glaring at me. Thanks for the overview! Thanks for the tutorial! I just told my little one that we are going to decoupage something, and now there are pictures to follow! That's funny, I just mod podged something today for the first time in my life...no instructions, just did it...I can't say it was the best time I have ever had in my life...but maybe next time I will try something pretty like yours...thanks! love that Mod Podge and paper. What a brilliant idea! Though I have to admit I don't have much for a collection of vases, many have fallen victim to run-through-shattering. You inspire me to go find some at a thrift store and give new life to though! I love it! 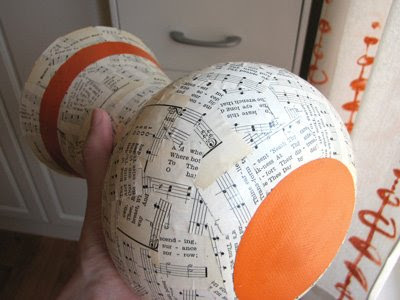 What a great use for an old hymn book, the music is pretty. 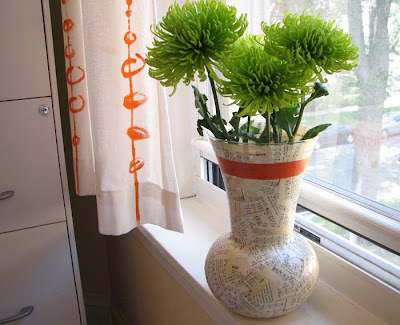 I have a secret love affair with mod podge, so I am always searching for new uses for it! Cool I definitely want to try this, though I doubt I'll end up with anything half as pretty as yours. Hmmm.... you might just get me trying decoupage! I want to do the same thing to a mini dress form. Thanks so much for the tutorial! Oh I am soooooo going to do this tomorrow, I have some Japaneese newspaper that woudld be awesome!!! Thanks for showing us how to do it, Plain glass is so boring after all. I've had a jar of this stuff on my work table for over a year now. Perhaps NOW I will finally be creatively motivated to crack it open! I just mod podged my worksurface. It was very easy! I blogged about it - check it out! Very nice! I love the green flowers in the vase too! Oh how I love me some mod podge. Ah, memories! I cannot tell you how many things I've covered with ModPodge in my youth. I even made a bedside bookcase out of an apple crate - covered it with cardboard and ModPodged color comic strips from the Sunday paper on it. Thanks for the trip down memory lane. hey jess! thanks for the additional tip for working with canvas. i will definitely try both options to see what works best... i will keep you posted! Great Idea! I just found my bottle of Modge podge and couldn't think of a project for it so i got rid of it. Looks like it is time for a trip to the craft store. oh !! very creative and pretty too!! I love decoupage and collage!!! Oooh I love mod podge. I just decoupaged my bathroom vanity. Not a permanent fix, but fun and funky until we can afford to replace it. Fun! I'm going to have to give this a whirl. Thanks for the instructions on decoupage! I had the day off today and so had at the change jar in my bedroom. I think it turned out pretty good! What a great idea! I've always wanted to learn how to do something like this. Thanks for the tips! Do you think that the stuff you use to etch glass would eat through the paper if you wanted to do some kind of design like that? Did you know you were featured on Threadbangers.com? I stumbled across that site and was cruising through it when I saw the featurette. I felt cool that I already knew about your blog and here it was featured. You rock! Lovely results. Way to save the Hymn book, good for you. I must say that I am a decopauge addict! Great project! You inspired me to open my bottle of Mod Podge finally --- I was a 37-year-old Mod Podge virgin. Very cute! I love Mod Podge too & did a scrapbook project this week with it. Love your vase.